Local Treks: Hiking Missouri and More: For the Birds: Juden Creek Conservation Area & More! For the Birds: Juden Creek Conservation Area & More! We had passed the bird house topped ancient gate and the small sign, pointing the way to Juden Creek hundreds of times. It seemed each time we took a jaunt to Trail of Tears State Park we would say, "We really should drop by there" and then pass on by... But, something was different on a particular Sunday, something made us turn in to Juden Creek Conservation Area, and I'm glad that whatever unforeseen force pushed us to visit the small park did, because the questions raised on our hike provided me a better vision and understanding of the area and even a bit of its history. In order to get to the trail head, you will take Hwy 177 (Big Bend Road) north throughCape Girardeau, MO. You'll then turn right (East) on old Missouri Route V, then turn right on Cape Rock road. You'll discover the parking lot for the trail on your right. This fairly worn trail will take you through Twin Trees Park, across a narrow band of Juden Creek Conservation Area, and then ending (somewhat abruptly) in the Kelso Sanctuary Natural Area. This trail does have inclines/declines to it and is not surfaced, so I would consider it to be a "moderate" hike. As we approached the trail head we were instantly aware of the wildlife, particularly the numerous songbirds, who chirped and sang as we began our journey. It wasn't far up the short ascent that the canopy of the hardwood forest quickly enveloped us as we made our way through the Twin Trees Park portion of the trail. A quick survey of the American Beech that are scattered throughout the woods provided me an explanation of why so many songbirds were to be heard here, as they love to devour the fruit of this tree. Interesting note on these Beech trees is that this is about as far West as you will find them, and one of the few places that they grow naturally in Missouri. As we continued we noticed TONS of wildflowers just beginning to emerge along the trail, with nearly every color of nature's vivid palette brilliantly brushed on to their petals. I would find out only later, that this area is known for the migratory birdwatching and the wildflowers. In fact, Wildflower Walks are sometimes provided during spring by the Cape Girardeau Conservation Nature Center so be sure to check their page if you're heading out there! 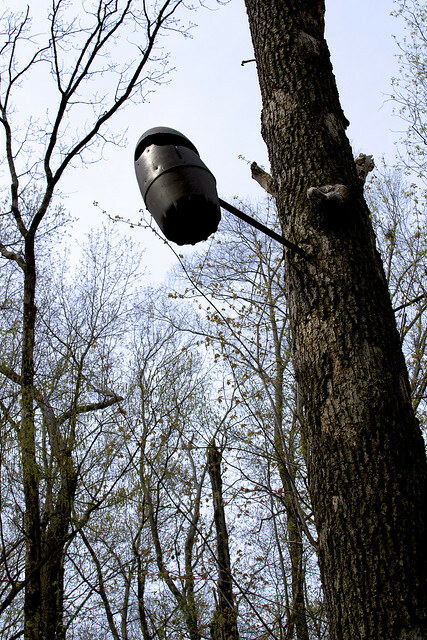 In the trees we would occasionally spot odd, dark, egg-shaped canisters that we assumed were installed to serve as bird houses, in order to attract even more birds to the area, so that they may sing even more songs for trail goers. 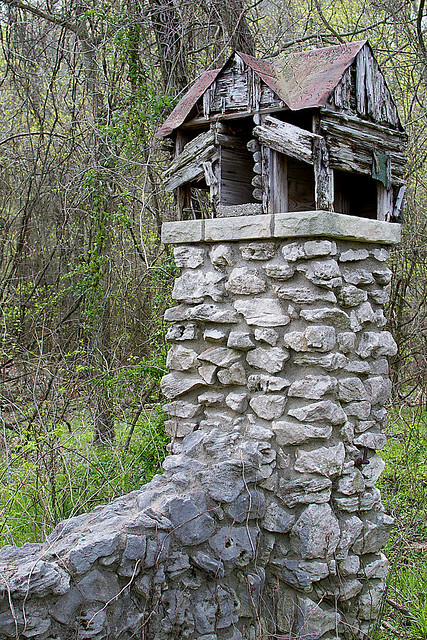 Many of these bird house seemed to have their entrances widened via the teeth of some squirrels or perhaps they were there to attract a different type of wildlife and had the entrances widened by man. If you may know what these canisters are there for, or what particular birds they may be attracting, please let me know. Despite my lack of knowledge as to whether or not man had widened these holes there was a distinct sign of man's impact on the landscape, the ravages of a suspicious 2009 brush fire, can still be seen on many of the trees and shrubs that line a good portion of the trail as it passes through the Juden Creek area. As we continued something else caught my eye. 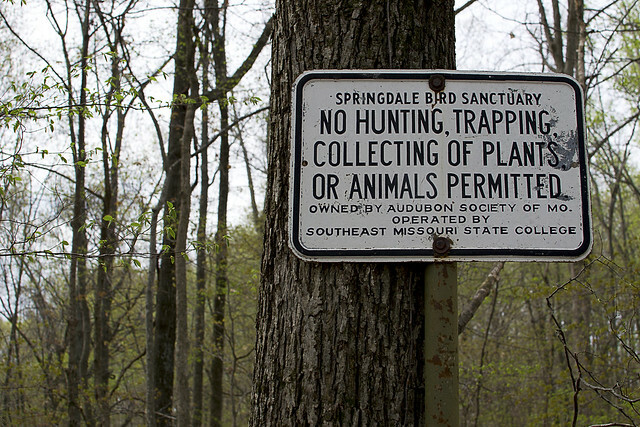 We began to see a scattering of signs for the "Springdale Bird Sanctuary", firmly attached to trees, yet I had never heard of such a place. 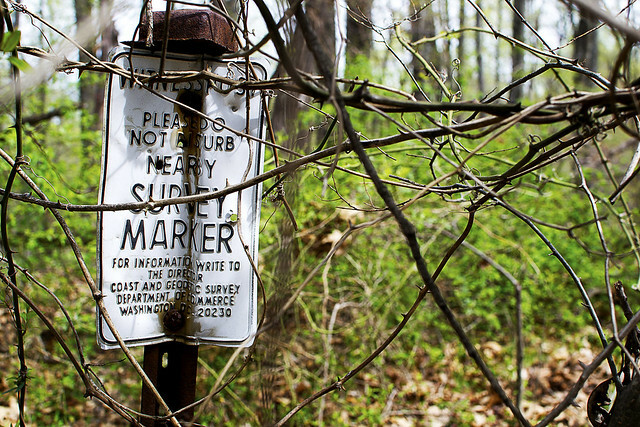 Many of the signs were weathered and bent, some with the paint peeling, and others peppered with pellet holes. I began to wonder if we had somehow ventured into another park or conservation area, or worse, if I had begun to tread (unknowingly) onto private property. After doing a quick search of the area, and finding no evidence of us being on private property, we continued on the trail, noticing a small pond, just barely noticeable through the trees that the trail seemed to be winding around. This particular area seemed absolutely THICK with pileated woodpeckers, who seemed to stay close enough for us to catch quick, brilliant glimpses of their beauty, but quickly flying away milliseconds before my camera could fully focus on them. We would discover yet another type of sign, one indicating a nearby survey marker, but we could not find the marker the sign was designed to protect (or perhaps it protected the marker too well). Our journey on the trail ended at an old building foundation, with a man gazing at us from his backyard... We decided then it was time to head back. Elephant Rocks State Park: Home to Views, Trails, and... Elephants? Shawnee National Forest Quarter Launch & Coin Exchange! 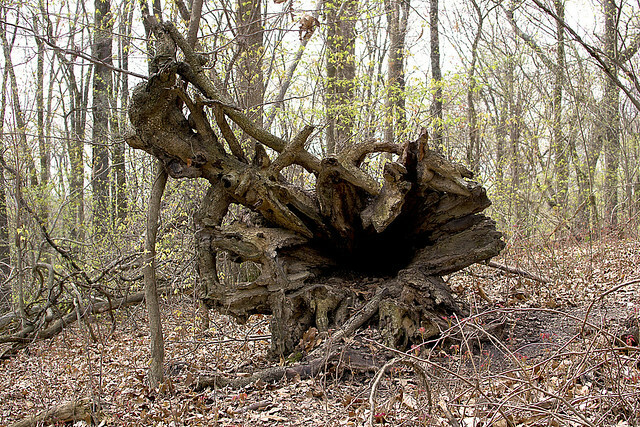 Big Oak Tree State Park: Take A Stroll With Giants.